Arizona State University celebrates innovation every day. Once a year, the state of Arizona shines a light on those who do it best. 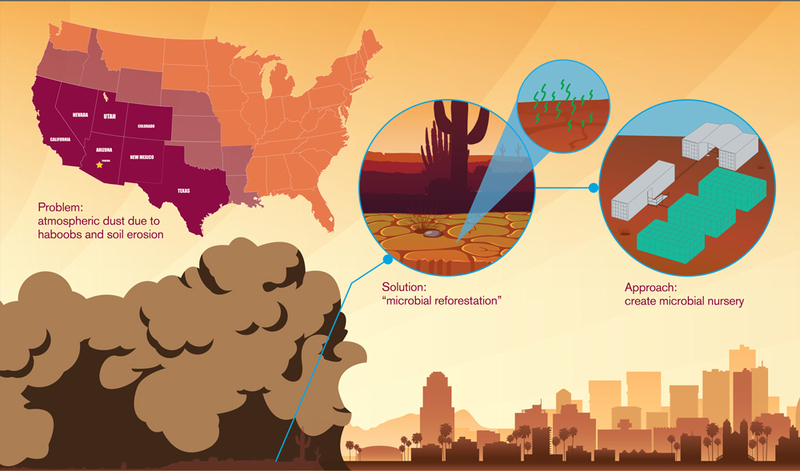 This year, ASU researcher and Professor Ferran Garcia-Pichel and his lab were recognized as finalists for the Governor’s Innovator of the Year – Academia award. “Our state is no longer content to rely upon traditional models focused on incremental growth,” Gov. Doug Ducey said. “In Arizona, we’ve pioneered transformation. We’ve become a state of disruptors, intent upon pursuing new ideas, and we’ve created the best environment in which to develop, test and scale cutting-edge technologies.” Ducey shared that 274,000 new jobs have been created in Arizona since 2015. Yasin Silva and Deborah Hall from ASU's West campus were also recognized as finalists for their BullyBlocker app, which employs predictive models and identification tools through social media to detect cyber bullying. Other Innovator of the Year Awards announced include start-up company Black Bar Engineering, small company CampusLogic and large company Benchmark. Arizona State University’s global footprint keeps expanding, including on the basketball court. 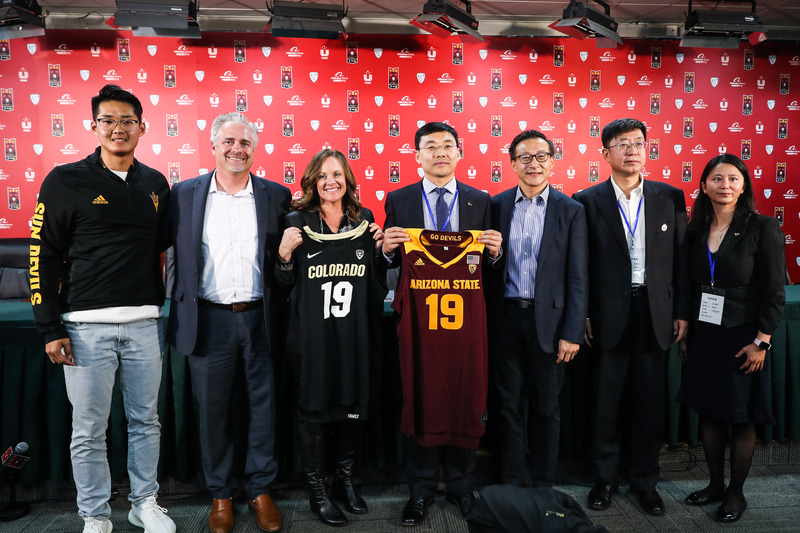 The Pac-12 announced a 2019 men's basketball matchup between ASU and the University of Colorado Boulder, the fifth edition of the Pac-12 China Game presented by Alibaba Group. “We are thrilled for the tremendous opportunity to showcase all the energy, investments and innovative ideas our campus has been working on and for a great educational experience for our student-athletes in China,” said Ray Anderson, ASU vice president for university athletics. ASU is the top public university in the United States for international students, hosting more than 13,000 international scholars. More than 3,500 are Chinese students, representing the largest contingent of international students at the university. “We already partner with many of the top Chinese universities, as well as the Chinese Academy of Sciences and Ministry of Science and Technology, so being part of this event is a natural step and one ASU embraces,” Anderson said. Next year’s matchup will not only allow the ASU basketball athletes to engage beyond the United States, but the university will continue to engage students, alumni and partners to connect with the university outside of the big game. ASU is a leader of innovation in American higher education, expanding use-inspired research beyond Arizona and engaging with people and issues locally, nationally and internationally. Through relationships with China and the Chinese people, the university works to promote language, innovation, business and leadership on a global scale. Over the last decade, ASU has pursued a deepening relationship with China and Chinese students and universities through multiple collaborations. The W. P. Carey School, ranked one of the top 25 business schools nationally, is directly involved in the development of top leadership in China. In partnership with Shanghai Advanced Institute of Finance, W. P. Carey launched a Doctor of Business Administration in Global Financial Management program at Shanghai Jiao Tong University where senior executive leaders can tap into the expertise of distinguished international thought leaders. Additionally, ASU opened its first permanent location in China last year. The building on the Hainan University campus is part of a partnership to offer degrees in tourism, the Hainan University-Arizona State University Joint International Tourism College. ASU's work with China and with Chinese institutions prepares students for a future in a high-speed, technologically advanced, globally competitive economy. To date, ASU has more than 2,400 alumni in China, with the largest number of graduates from the W. P. Carey School of Business with more than 1,500 graduates. The Pac-12 China Game is the flagship event of Pac-12 Global, designed to grow the global popularity of Pac-12 athletic programs and universities, fostering cultural exchange through sport and creating educational experiences for Pac-12 student athletes. The matchup between the Sun Devils and Buffaloes, tentatively scheduled for Saturday, Nov. 9, and for national broadcast in both the U.S. and China, will not count as a conference contest.